Educational Qualification : Passed Graduation in Concerned Discipline with 50% Marks and 6 Month Computer Certificate Course and 30 wpm Typing Speed on Computer. 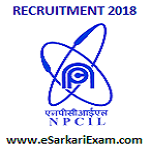 Eligible Candidates can Submit Application at the Official Website of NPCIL Latest by 14th December 2018. Click on Recruitment of Assistant Gr I at MAPS Link.